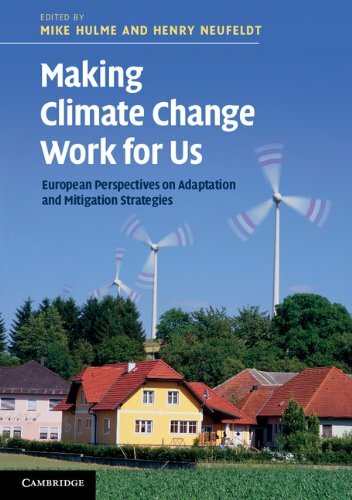 Making Climate Change Work For Us: European Perspectives On Adaptation And Mitigation Strategies (The Adaptation And Mitigation Strategies: Supporting European Climate Policy): 9780521119412 Hardcover - LIMEROCK BOOKS INC. Introducing the main challenges and opportunities of developing local, regional and global strategies for addressing climate change, this book explains the dilemmas faced when converting strategies into policies. Providing a synthesis of the findings of the three-year European Commission ADAM (Adaptation and Mitigation Strategies) research project and written by many leading interdisciplinary climate change research teams, European strategies for tackling climate change are placed within a global context. The book illustrates the differences between adaptation and mitigation, offers regional and global case studies of how adaptation and mitigation are inter-linked, and suggests six different metaphors for the strategic options to make climate change work for us, rather than against us. Offering practical solutions to climate change - both adaptation and mitigation - within the policy contexts in which these solutions have to be implemented, this book is valuable for researchers in varied related fields, as well policymakers in government, industry and NGOs. Presenting local, regional and global solutions to climate change, both adaptation and mitigation, this book explains the dilemmas faced when converting strategies into policies. Leading interdisciplinary climate change research teams synthesise the findings of the European Commission ADAM (Adaptation and Mitigation Strategies) project, offering important information for researchers and policymakers.